The popularity of satay at Ms Violet Oon's existing restaurants resulted in the decision to open a satay bar. Cooking doyenne and restaurateur Violet Oon recalls eating satay at the third iteration of Singapore's Satay Club at Clarke Quay in 1995. In February next year, the 67-year-old will open her own Violet Oon Satay Bar & Grill at the nightlife destination. 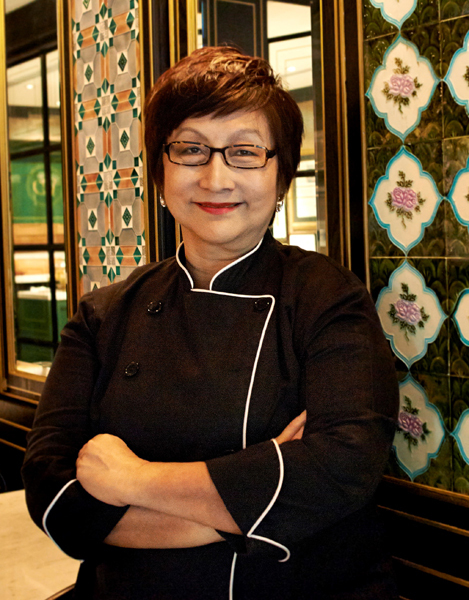 She also owns National Kitchen by Violet Oon at the National Gallery Singapore and Violet Oon Singapore in Bukit Timah. She says: " I remember dining at the same outdoor spot just near the outdoor dining area of my restaurant 21 years ago. It's a happy coincidence to launch the new concept in Clarke Quay, which is itself a historical enclave of old warehouses." Before relocating to Clarke Quay, the Satay Club was at Beach Road and the Esplanade. Ms Oon's 1,900 sq ft restaurant is beside Clarke Quay's taxi stand, facing Fort Canning. It is in the early stages of renovation. When done, it will have private dining for up to 14 people and a 40-seat alfresco space. It will launch with dinner service first, from 6pm till late. Diners will get to watch satay, meats, seafood and vegetables being grilled over an open fire in the kitchen. There will also be a small plates menu, with new dishes such as charcoal-grilled buah keluak otak otak. Also on the menu are favourite dishes from her two existing restaurants: kueh pie tee, beef rendang, babi pongteh and dry laksa. Prices for these dishes will remain the same as in the other outlets, says Ms Oon, who is still working on the pricing for the satay and grilled items. On why she decided to open a satay bar, she says: "We were thinking of the next step of expansion and noticed that our satay is very popular. It fits in with the location as well. Plus, cooking on a charcoal grill is another part of our culture, although it may be considered old- fashioned. "There is so much in our food encyclopaedia to explore, so I want to capture some of it." Her business partner is Mr Manoj Murjani, 46, chairman of Group MMM, an investments and acquisitions group that focuses on developing lifestyle, hospitality and food and beverage companies and brands. Ms Oon's son Yiming Tay, 35, and her daughter Su-Lyn Tay, 40, also work with her. Since the tie-up with Mr Manoj last year, Ms Oon's Bukit Timah outlet was renovated and National Kitchen by Violet Oon opened. While Violet Oon Satay Bar & Grill will be more casual than the fancy National Gallery location, says Ms Oon, it will have the signature Peranakan tiles used in her other restaurants. The home-grown brand also will stick to tradition. Mr Tay says: "Our goal is to preserve the traditional methods of cooking and flavours and not take any short cuts. "It is really 'slow' cooking because the flavours come from spices that are painstakingly processed." Violet Oon Satay Bar & Grill opens in February at 01-18 Clarke Quay, 3B River Valley Road. This article was first published on Dec 22, 2016.